This old, well-known variety was discovered as a chance seedling by John McIntosh in 1811. Its deep-red finish sometimes carries a green blush. Juicy, tangy, tart McIntosh has a tender, white flesh. It is best used for snacking and applesauce, but some people enjoy its tart flavor in pies as well. This apple is typically available from September through May. Cook’s hints: McIntosh cooks down easily; if pie making, cut slices thick or add a thickener. McIntosh apples are harvested in late September. 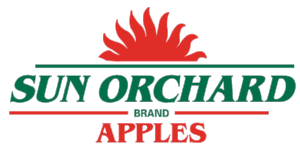 You can find Sun Orchard McIntosh in retailers September through April.